Our Merry & Bright single candle traditional centerpiece features a mixture of red standard and miniature carnations as well as white chrysanthemums, with evergreens of Balsam and Pine. Accents of miniature pine cones, ribbon tucks, and red snowflakes add a little whimsy. Make someone's holiday bright with this table centerpiece as it contains a pomegranate colored taper candle. 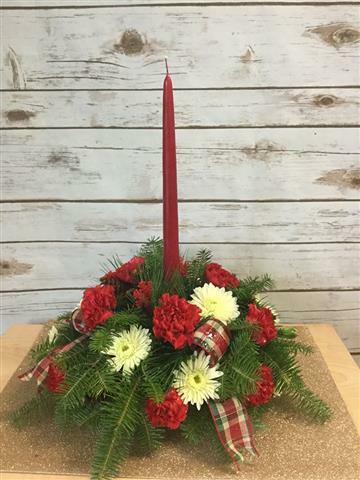 Our Merry & Bright centerpiece measures approximately 13" in diameter and 14" tall to the top of the candle. Colors & Varieties May Vary. Other Ribbon & Candle Colors Available Upon Request.